Bar crawls are a great way to experience the nightlife in a new city and meet fellow travellers from across the globe, without the risk of wasting your trip by misjudging the local scene, paying over the odds for drinks, or ending up in a club that no-one goes to. 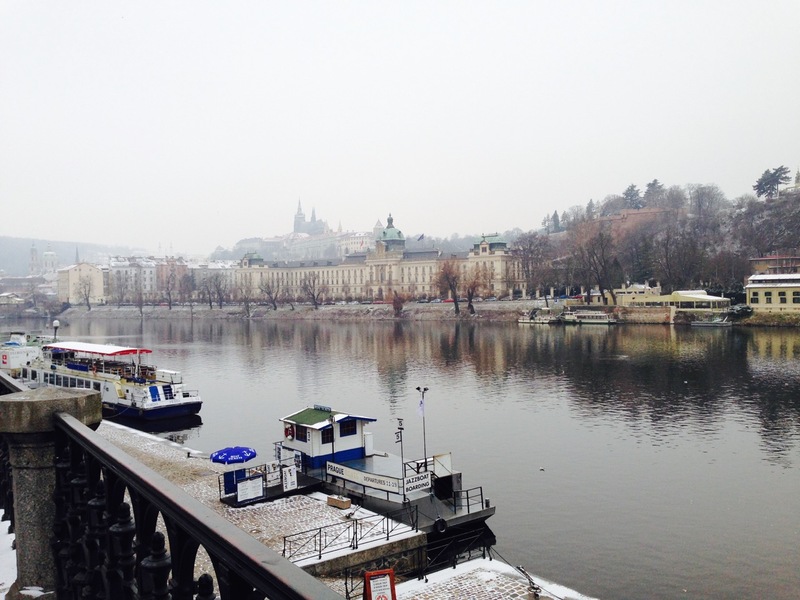 Back in January 2014, three friends and I found this out first hand as we headed on a city-break to Prague, a city known for cheap beer, wine and absinthe. Needless to say, we made the most of this. apartment (just £60 each!) situated near the Rolex and Hugo Boss shops at Staroměstská. Eneko and I arrived in the city centre around 9, just a short trip from the airport by bus and underground, which cost under 50p, heading straight for a local pub for beers and goulash. 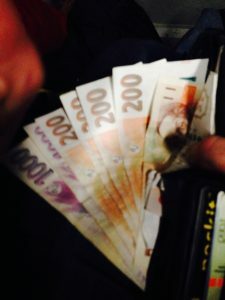 The plan instantly backfired as James and Paul’s flight got delayed, leaving Eneko and myself to sit in the apartment counting our money while listening to euro dance on the local music channel. When they finally arrived at around 2 am, we headed for Dlouhá, which is Prague’s equivalent of Malia’s strip, only less trashy. Here you’ll find the famous Beer Museum Pub, serving an endless array of local lagers. Sadly by this time things were dying down there, so we headed to Harley’s Bar, the self-proclaimed “coolest place on earth”, where the party was well and truly in full swing. Much to James’ pleasure, the club played a mix of hard rock and classic rock initially, before switching to rap and classic hip hop as the night wore on. A word of warning – if you visit this bar don’t expect it to be as cheap as other venues in Prague – drinks aren’t cheap as you’ll be given the top shelf spirits, plus reports of gross overcharging on their Trip Advisor page. To be honest however, we found the drinks to be reasonably priced, it was only after we’d visited some other bars later in the trip when we realised that we’d spent a fair bit on drinks here. The crowd here were largely locals in their late 20s and 30s who didn’t speak much English. Unfortunately although the club was packed out when we arrived, with people dancing on the tables and bar top, it thinned out quite quickly, though we did arrive late. By 4 am the dance floor was rather sparse, occupied mainly by two groups of women plus a pair of marauding old men. Once we’d had enough we came across Burrito Loco around the corner, a fast-food Mexican joint. Their quesadilla is possibly the best post-night out snack I’ve ever had! Emerging from the wreckage in the early afternoon, we ventured out to find somewhere to eat, settling on a local restaurant to the south of the Old Town Square. 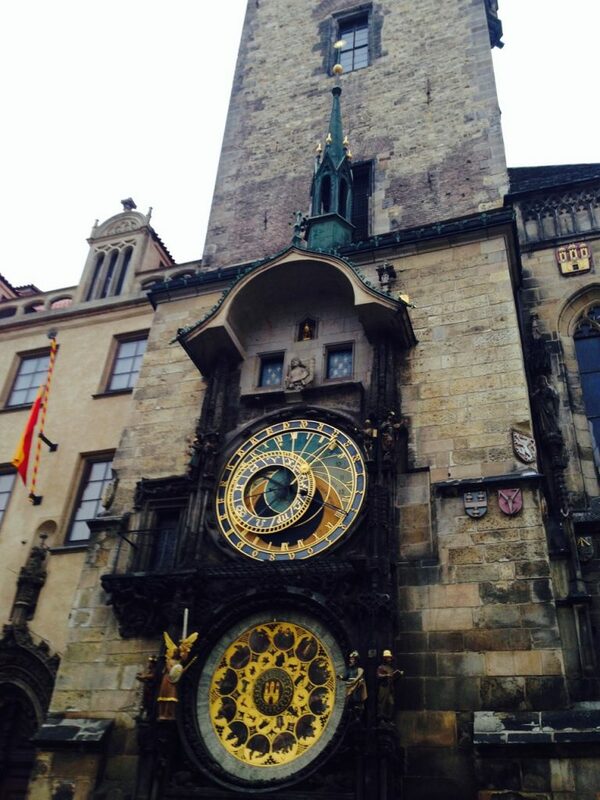 All plans to do something cultural were immediately abandoned when our hangovers finally caught up with us, though we got a chance to see the Astronomical Clock in the square. Make sure you’re there on the hour or you won’t find out what all the fuss is about! We then returned to base camp to plan our evening activities. Lets face it, the real reason why we came to Prague was to have a few good nights out, and after spending a night at Harley’s with the locals, we decided it was time to try out one of the bar crawls, leaving the entertainment plans in the hands of the the guides, who hopefully knew the city better than we did. 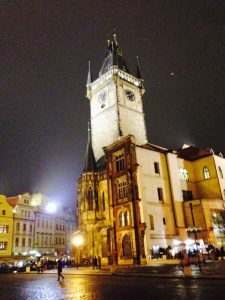 Prague has two pub crawls aimed generally towards 20-something backpackers: the Prague Bar Crawl and the Clocktower Bar Crawl. With two nights to go, we knew we could fit both in. We opted for the former for the Friday night, after seeing the generally positive reviews online. Promising an hour of unlimited drinks followed by free entry to three clubs for 500 CZK or 20 euros, it was an offer we couldn’t refuse! As with all bar crawls I’d been on, upon arrival everyone generally stuck to their own groups. Clearly some social lubricant was needed, at which point the bar opened and we stocked up on as many beers and shots as we could carry. 30 minutes in and it was already clear who the Englishmen were, as a group of northerners began some rowdy drinking games while we followed suite by downing our stockpiled beverages. At this point a Frenchman scoped us out from across the room and appeared with six shots, immediately dispatching them. Anglo-French relations were at an all-time high. Once the hour was up we were ushered out and towards the first bar, getting to know the other guests on the 10 minute stroll. 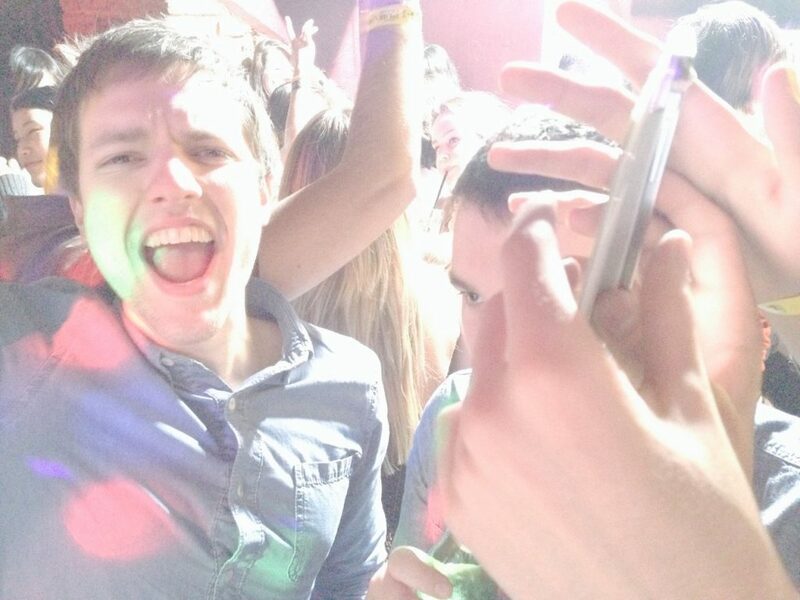 Things kicked up a notch at the next club as the DJ pumped out some top tunes. I can’t remember what the club was called but it was genuinely the best atmosphere of the entire trip as everyone was crammed into a tiny dance floor with Martin Garrix’s Animals blasting out the speakers. We then moved on to another club, again no recollection on the name. The northern lads found time to stock up on a few roadies en-route, with one nonchalantly downing a 35cl bottle of Jack Daniels. We never saw him again that night. After a few more drinks and some dancing, we departed for the final club, the legendary Karlovy Lazne near the Charles Bridge. With five storeys, each dedicated to a different genre of music, it seemed a fitting end to the night. As the club was quite a distance away, the bar crawl group piled into a bus which would take us most of the way. Upon arrival we discovered that only three of the five main rooms were open, two of which were almost deserted, though in the club’s defence it was late January, so not peak season. The club more than made up for it in the fact that pints of beer were on special offer at just 20 koruna, approximately 57p, giving us all a powerful second wind. By about 6am it was time for us to go, taking the long trek home, via the 24 hour McDonalds. We were on it again by the mid afternoon, enjoying a few pints of Kozel to wash down yet more traditional Czech food. We planned to try the Clocktower Bar Crawl that night, and as it was the 26th January, they had laid on an Australia Day party. After a quick nap and some sustinance curtesy of Subway, we headed out to the first bar just off the Old Town Square in an underground labyrinth, where a range of drinking games had been set up for us, to be played during a WHOPPING 90 minutes of open bar, plus free Burger King burgers that night! The price was the same as the Prague Bar Crawl, hinting at the fierce rivalry between the two organisers. The previous two nights had taken their toll, so we set up basecamp around one of the foosball tables in front of the huge painting of Lenin and Stalin chilling, playing several rounds while consuming our supply of beer and vodka-mixers. 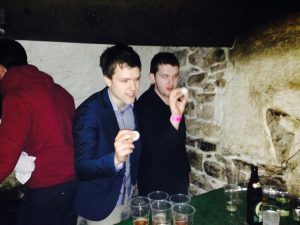 After conceding a screaming 70-yard own goal, James and Paul ventured into the main room, joining a group of american girls at the beer pong table. A fierce battle ensued, and after several rounds the americans won a decisive 4-1 victory. To be fair,they’d cut their teeth over 4 years at college, where beer pong is treated like a national sport. 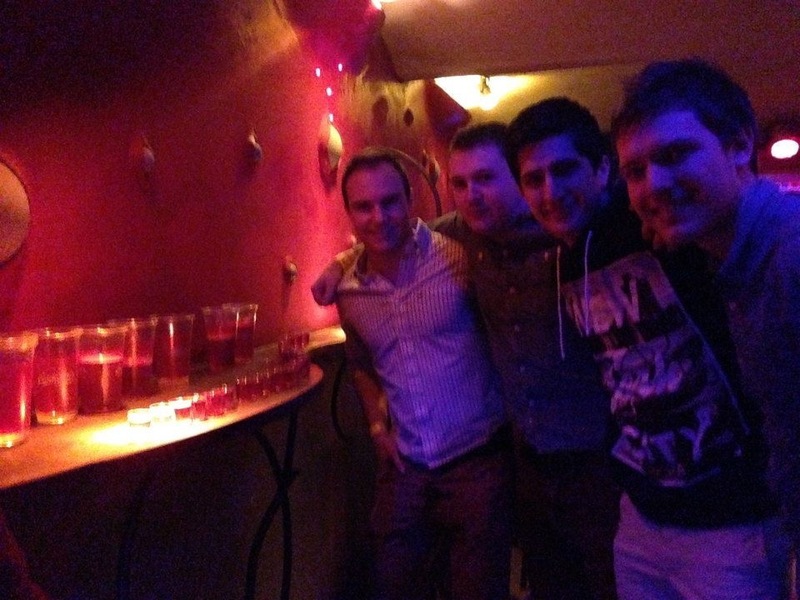 All in all, a top start to the night, before we moved on to four more clubs where we each received a free entry shot. The final club was in Prague’s new town, and much smaller, resulting in a better atmosphere as it was more packed out. Sadly, much of the bar crawl group had ducked out early at this stage, likely down to the ample supply of drinks that the organisers handed out. By this point however, we’d had our fair share of alcohol, resulting in a hazy memory of the remainder of the night, and it seemed many of the others on the tour were hit hard too, as the group really started to dwindle by the time we reached the final bar. 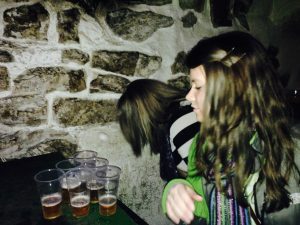 Which Prague bar crawl is best? 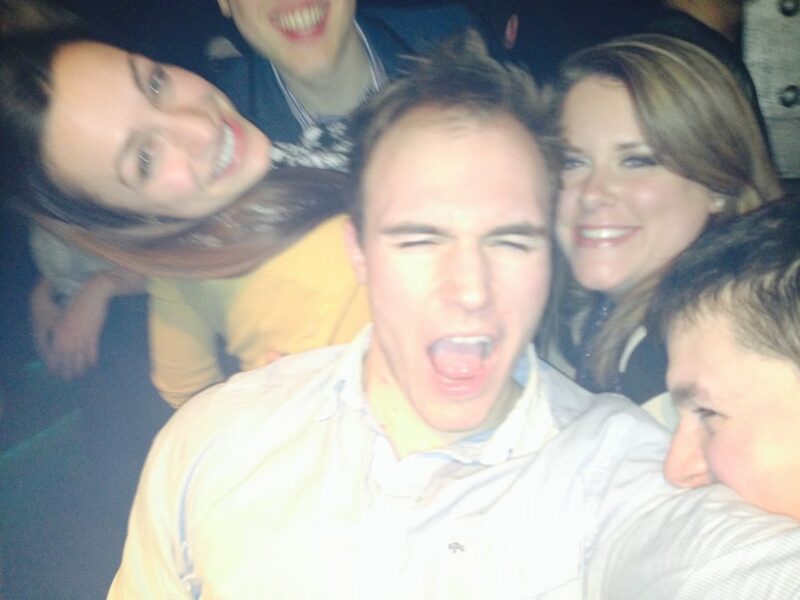 Both bar crawls were a lot of fun and are a great way to meet other travellers. Although we went in a group of four, they’re ideal for any solo travellers looking to meet like minded people. Each were dominated by a similar demographic, mainly Aussies, Americans, Brits, and a few token Kiwis, but also several groups of French, Germans and other Europeans. The result was a broad mix of people all out to have a good time, and plenty of opportunities to learn about other peoples’ travels. Both groups numbered between 30 to 50, which is fairly high considering it was the off season when we went back in January 2014. The Clocktower bar crawl put on the best session at the first bar, thanks to the range of drinking games they’d set up, though be sure to check what’s planned for the day you’re attending – it was Australia Day when we went so a few activities and extras such as free food were laid on specifically for the occasion. 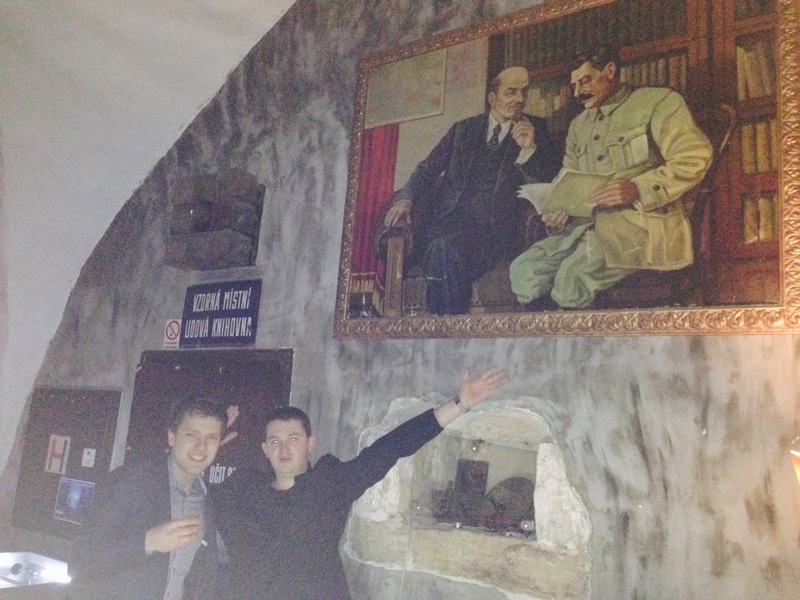 However, the Prague Bar crawl ends at the 5 floor Karlovy Lazne, which no doubt will be packed out in peak season. Therefore, the choice really comes down to what time of year you’re traveling, but if you can fit it in, try and go on both crawls!